A Storybook Fantasy Comes to Life as Duffy the Disney Bear Marks His Debut at the Park(Hong Kong, November 18 2010) When it comes to enjoying the magic of the holiday season with family and friends, there��s no place like Hong Kong Disneyland Resort. The holidays will shine brightly throughout the resort from November 19, 2010 through January 2, 2011, as it transforms into ��A Sparkling Christmas �C A Storybook Fantasy��. Guests will be immersed in the storybook setting as they walk through snowy Main Street, U.S.A. Christmas Town and catch a glimpse ofthe larger-than-life Gingerbread Village. Duffy��s Debut in Hong Kong! Hand-made by Minnie to be Mickey��s companion, the beloved Duffy the Disney Bear will be greeting Guests at Main Street, U.S.A. Christmas Town. Do not miss the exclusive Duffy merchandise, including Duffy key chains, Duffy Plush and Duffy��s festive Christmas costume. From the glistening 60-foot tall Christmas tree in Town Square to the street complete with falling snow, candy canes and gingerbread, a storybook fantasy comes to life along Main Street, U.S.A. Christmas Town. Friendly elves bring Christmas cheer to Guests on the street, while the Carolers sing lovely Christmas songs you are sure to know. The whole town is filled with whimsical Christmas ambience! Discover the Gingerbread Village at the end of Main Street, U.S.A., where the houses are decorated in jolly Disney style with sweets and candy canes everywhere. As Guests meander from house to house, they can look into the windows for a peek at colorful settings of Disney friends preparing food and gifts for the Christmas season. This is where the Christmas spirit of A Storybook Fantasy comes to life. When the Christmas lights on Main Street U.S.A. dim, the magic of A Sparkling Christmas brings the toys to life and creates a dream-like Procession of Toys. To the tune of delightful Christmas carols, the dream-like toy procession will crescendo with an illumination and the charm of snow falling in Christmas Town. Don��t miss out on this magical moment every evening when Minnie surprises Mickey with Duffy the Disney Bear under the sparkling Christmas tree! Inspired by Duffy, Disney friends are also in the Christmas mood with their most imaginative costumes. 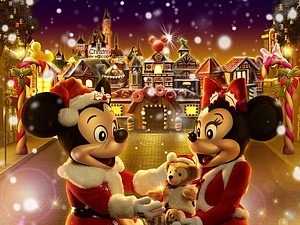 Mickey and Minnie Mouse dressed as Santa and Mrs. Claus; Pluto dressed as a reindeer; Donald and Daisy wearing candy cane inspired costumes; Chip and Dale as gingerbread men and Goofy as a toy soldier. Guests should have their camera ready for these memorable meets & greets. The storybook fantasy continues as Guests set sail around the world on it��s a small world Christmas. Look for Disney characters along the ride and see them in preparation for the holiday celebrations. The spectacular ��Let It Snow�� Christmas Parade is back by popular demand to bring yuletide cheer like no other. Join in the merriment as hundreds of dancers perform a glittering procession. Get ready for unexpected weather as we have word that snow is forecasted throughout the show! Hong Kong Disneyland Hotel is bringing the spirit of Christmas into all of its Resort Suites for the first time to elate Guests with even more holiday delights. Guests who stay at any Kingdom Suite will be immersed in the yuletide spirit with complimentary holiday room decorations and a special holiday hamper! 18. Fantasyland Play Party with Minnie Mouse and her friends.